Limerick is well-known and famed for its bacon production, “everything but the squeak was used”. Many of the households in areas such as the Abbey kept pigs along with the more traditional chickens usually fed on domestic scraps as well as on root crops. Although the majority of the pigs were imported from the local environs. Thousands of pigs were slaughtered and processed weekly in the Limerick Bacon factories, who in the height of their production were the most consumed pork products in the British Isles. In the 19th century Limerick Hams became renowned throughout the British Empire with Queen Victoria insisting on Limerick hams at her Christmas dinner. 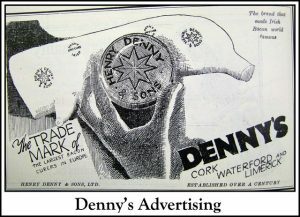 Limerick pork through the O’Mara’s was even exporting as far away as Russia and Romania in 1891 and 1902 respectively. 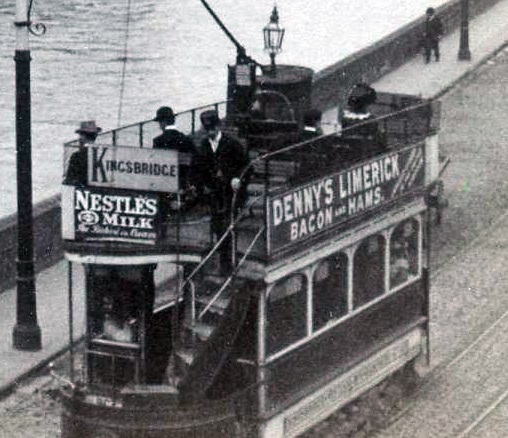 The four great bacon factories in Limerick were Matterson’s, Shaw’s, O’Mara’s and Denny’s each competing for local, national and international trade out of Limerick city during the 19th and early 20th Centuries. Other Bacon Merchants in Limerick City during this period were Hogan, Longbottom, Looney, Lynch & Spain, Neazor, O’Brien, O’Connor, O’Halloran, Prendergast, Rea, Sullivan, Thompson though this article concentrates on the four major players. The bacon industry was wrought with tragedy and some of the stories can be read on the Factory Fatalities page. Further reading on the bacon factories can be found in this issue of The Old Limerick Journal. 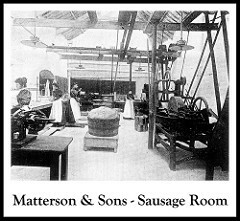 J Matterson & Sons operated out of Roches Street, while their rival company O’Mara’s operated across the road on the same street from 1839. 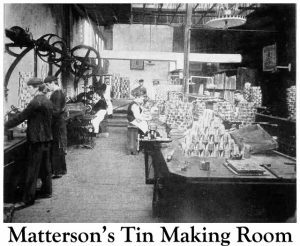 Mattersons was established in 1816 by John Russell and J Matterson, who were brother-in-laws of a kind. Both men married a Mossop sister, Mary and Eleanor. After the death of Joseph Matterson Snr in 1854, Joseph Matterson Jnr took over the Limerick aspect of the company. While Joseph Matterson Snr’s other son William Matterson, oversaw the London branch of the business. William Matterson died aged 71 in London in January 1903. Not only was Joseph Matterson Jnr. a business owner in the city but he was also a key player in the community. He was vice president of the Protestant Young Mens Association which stained-glass window still remains in-situ in O’Connell Street. Below are the funeral notices from the Limerick Chronicle, from the Limerick City Library Local Studies, for members of the Matterson Family. Matterson, Henry Sutherland, 81 George Street, Limerick Chronicle 12 September 1876, aged 13 months; son of Joseph Matterson Jnr. Matterson, Mary, Castletroy House, Limerick Chronicle 1st June 1886 aged 82, widow of late Joseph Matterson Snr, death notice. Matterson, Mary Gordon (Molly), Castletroy House, Limerick Chronicle 05 May 1896, aged 17, daughter of Joseph Jnr and Agnes Matterson (funeral report) (reply to condolences). Matterson, Joseph, Castletroy House, Limerick Chronicle 3 April 1906, (further report 1) (further report 2) (funeral report) – buried in Kilmurry Graveyard. In 1901 Joseph Matterson, Jnr aged 60 was living with his 46 year old wife Agnes and children Leopold (18), Vera Sunderland(9), Victor (7), Eva (5) and a seven various servants. Joseph Matterson Jnr and his wife Agnes had 12 children in total with 9 still living in 1911, married 33 years. After Joseph’s death in 1906, Agnes and family moved to the Ennis Road, her children Ian Gordon and Vera Sunderland were living with her in 1911. 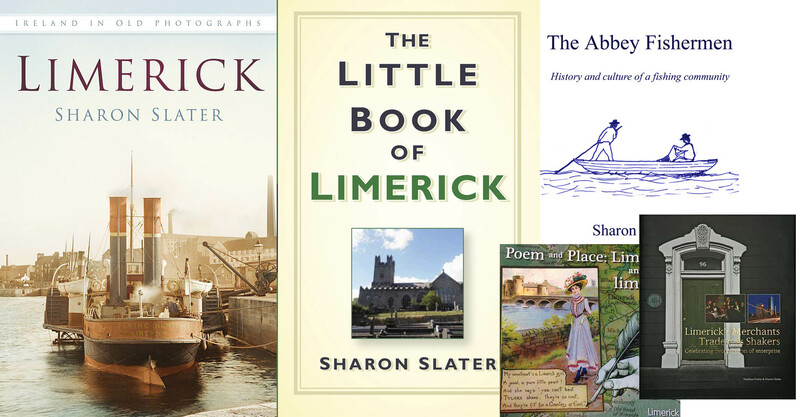 The following also courtesy of Pat Mossop is a wonderful letter written by a Limerick lady in 1873: Eleanor McGhie, an article by Sharon Slater based on the letter was published in the Old Limerick Journal. Shaw & Sons operated out of Mulgrave Street. It was founded in 1831 by William John Shaw, whose family originated in Co. Down. 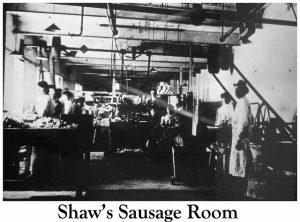 In 1892 Shaw’s factory was using electric lights, lifts, a mini-railway and even telephonic communications, the Shaw’s factory was well ahead of it’s time. It is now owned by the Kerry Group. Below are the funeral notices from the Limerick Chronicle, from the Limerick City Library Local Studies, for members of the Shaw Family. Shaw, Martha, Rose Cottage, Limerick Chronicle 14 April 1868, wife of William John Shaw – buried in St. Munchin’s Graveyard. Shaw, Harriett E., Willowbank, Limerick Chronicle 30 August 1879, second daughter of William John Shaw, Esq. Shaw, James Thompson, South Kensington, London, Limerick Chronicle 18th October 1892, senior partner of W. J. Shaw & Sons (further death report) (sympathy vote) (acknowledgement) – Eldest son of William John Shaw. Shaw, Anna Gertrude Thompson, Cheltenham 13 June 1918, daughter of late William John Shaw, Limerick. Alexander William Shaw – 27 October 1847 – 29 November 1923 Derravoher North Circular Road,bacon curer and local politician and the founder of Limerick and Lahinch golf clubs. He was born in County Limerick, the second son of John Shaw (son of WJ Shaw) of Willowbank, bacon merchant. 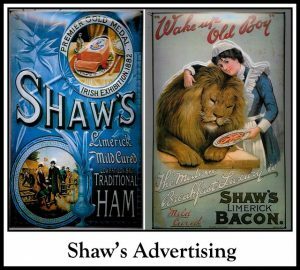 The family firm was already thriving when he took it over, but under his astute management it grew to become one of the largest bacon curing businesses in Europe, and Shaw became one of the most prominent businessmen in the city. 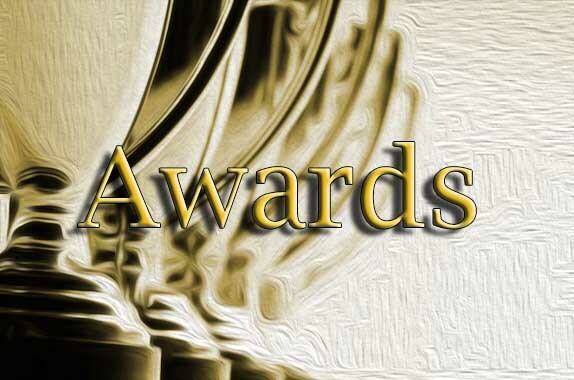 J. O’Mara & Sons was founded by James O’Mara who was born in Toomevara, Co. Tipperary. James O’Mara’s originally began curing bacon in the basement of his house on Mungert Street. In 1839 he moved his business to a purpose built factory on 30 Roches Street at the junction of Anne Street, across from their rival Matterson Bacon Factory. He also moved his family during this time to Hartstonge Street. The O’Mara’s factory was demolished in the late 1980s to make way for the multi-story which stands in the spot today. O’Mara’s 100 year lease on the site on Roches Street ended on 18 June 1979. Below are the funeral notices from the Limerick Chronicle, from the Limerick City Library Local Studies, for members of the O’Mara Family. O’Mara, James, jun., Limerick Chronicle 8th July 1893, son of James O’Mara, J.P. (funeral report 10/7/1893) (2,420 Kb) – buried Mount Saint Lawrence Cemetery. More information on the O’Mara factory in Limerick can be read on this Old Limerick Journal article. More information on the O’Mara family can be found at Mark Humphry’s Site. Denny’s and Sons operated out of 27 Upper William Street in in 1891 as well as Mulgrave Street. It was founded by Henry Denny in the 1870s and first operated as a Provision Merchants out of Newtown Mahon, Upper William Street. Denny operated out of Limerick, Cork and Waterford. Denny’s sausages make an appearance in James Joyce’s Ulysses, where Leopold Bloom watches a young girl in Dlugacz’s butcher’s shop buy a pound and a half of Denny’s sausages, as he waits to buy a pork kidney for his and wife Molly’s breakfast. Denny’s is now owned by the Kerry Food group, after they acquired it in 1982. Below are the funeral notices from the Limerick Chronicle, from the Limerick City Library Local Studies, for members of the Denny Family. Denny, E. M. , Kent, L. Chronicle 21/1/1905, head of Messrs Denny & Co. Thank you Joyce, I am glad you enjoy the site. If I come across Michael Cooney in my research I will let you know.